Situated in the biggest town in Eastern Iceland, in Egilsstadir, the Hotel Edda Egilsstadir is a perfect base from which exploring this Icelandic town, which boasts its own International Airport (Egilsstaðir Airport EGS) and lots of interesting sights and attractions, such as Iceland's main forest Hallormsstaður, the Atlavik Sandy Cove, the Mount Snæfell Volcano, and the Lagarfljot River. According to myth, Lagarfljot is home to a monster similar to Nessie, who lives in Scotland's Lake Loch Ness Whether you visit Iceland to practice water sports or watch the birds, the Hotel Edda Egilsstadir is the best place to stay in Egilsstadir! It offers cosy guestrooms, including family rooms and an on-site restaurant with marvellous river views. Other facilities at Hotel Edda include meeting rooms and the huge amount of wonderful sightseeing attractions! 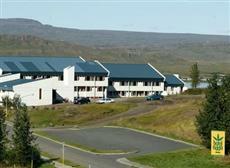 Hotel Edda is the oldest group of hotels in Iceland. With decades of experience in providing comfortable refuge to weary travellers, the Edda Egilsstadir knows exactly how to pamper you after a busy day in the Eastern Iceland! Please note: the hotel is open from 1 June 2011 to 19 August 2011.